NEW YORK, NY – August 30, 2018 – MoviePass™, the nation's premier movie-theater subscription service and a majority-owned subsidiary of Helios and Matheson Analytics Inc. (NASDAQ: HMNY), and Postmates, the only on-demand platform that can deliver anything from anywhere, announced today that MoviePass members will be offered special discounts and credit toward both services through promotions within the MoviePass app. This MoviePass and Postmates engagement provides an additional benefit to MoviePass members as MoviePass continues building upon its plans for long-term growth. 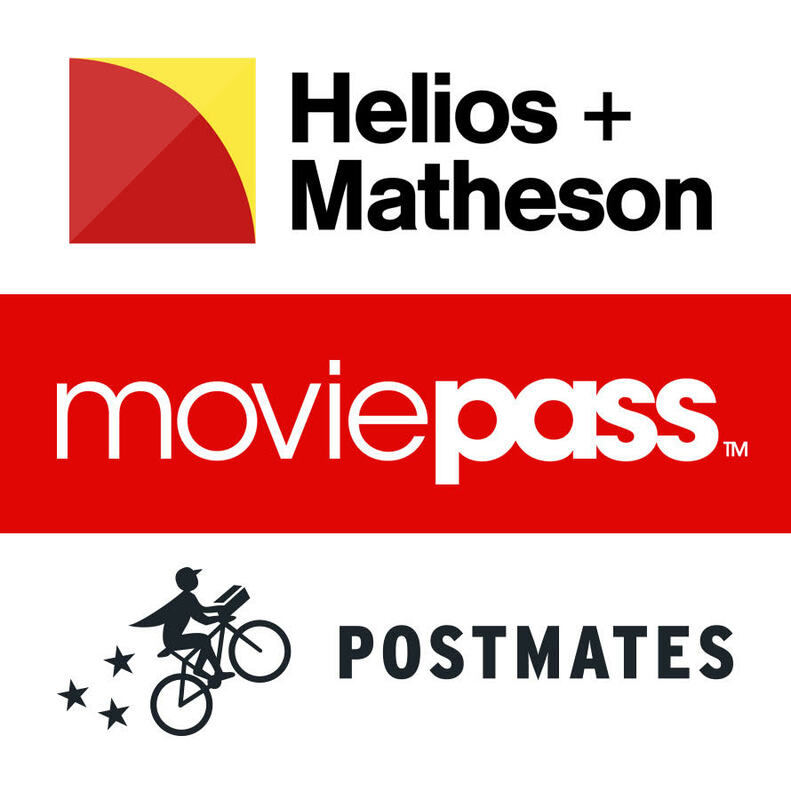 MoviePass will promote Postmates within its app and on Helios’ Moviefone.com website and provide MoviePass members with access to Postmates delivery credits, a week-long free trial of subscription service, Postmates Unlimited, and a credit toward one month of MoviePass. Postmates is a market leader and as the originators of on-demand 'anything,' Postmates gives customers access to over 250,000 merchants that were previously inaccessible online in over 385 cities. Postmates has helped create an alternative infrastructure for local businesses to better compete against retail goliaths. The company now completes millions of deliveries a month, and generates over a billion dollars in GMV annually. This relationship is part of MoviePass’ larger strategy to provide an array of valuable deals to its member-base, tapping different companies and brands to develop creative and innovative consumer offerings. Previous MoviePass brand partners include iHeartMedia, Fandor, Costco and others. Additionally, this relationship furthers MoviePass’ ongoing effort to develop non-subscription-based revenue channels. MoviePass Inc. (“MoviePass”) is a marketing technology platform enhancing the exploration of film and the moviegoing experience. As the nation's premier movie-theater subscription service, MoviePass provides film enthusiasts the ability to attend select new movies in theaters. The service, now accepted at more than 91% of theaters across the United States, is the nation's largest theater network. Visit us at moviepass.com. Helios and Matheson Analytics Inc. (Nasdaq:HMNY) (“Helios”) is a provider of information technology services and solutions, offering a range of technology platforms focusing on big data, artificial intelligence, business intelligence, social listening, and consumer-centric technology. Helios currently owns approximately 92% of the outstanding shares (excluding options and warrants) of MoviePass Inc., the nation's premier movie-theater subscription service. Helios's holdings include RedZone Map™, a safety and navigation app for iOS and Android users, and a community-based ecosystem that features a socially empowered safety map app that enhances mobile GPS navigation using advanced proprietary technology. Helios is headquartered in New York, NY and listed on the Nasdaq Capital Market under the symbol HMNY. For more information, visit us at www.hmny.com. Postmates helps people unlock the best of their cities – and their lives, with an insanely reliable on-demand "anything" network. Launched in 2011, Postmates pioneered the on-demand delivery movement in the US by offering delivery from restaurants and stores previously only available offline. The company now operates in 385 US cities, as well as Mexico, and provides access to over 250,000 merchants. Postmates is headquartered in San Francisco and has 680 employees. Learn more: www.postmates.com. Such forward-looking statements are based on a number of assumptions. Although Helios’ management believes that the assumptions made and expectations represented by such statements are reasonable, there can be no assurance that a forward-looking statement contained herein will prove to be accurate. Actual results and developments (including, without limitation, plans for long-term growth and profitability) may differ significantly from those expressed or implied by the forward-looking statements contained herein and even if such actual results and developments are realized or substantially realized, there can be no assurance that they will have the expected consequences or effects. Risk factors include, among other things: the ability to successfully develop non-subscription based revenue channels through partners such as Postmates; whether or not MoviePass subscribers will utilize the Postmates promotions; Helios’ capital requirements and whether or not it will be able to raise capital as needed; the success of MoviePass’ cost-reduction measures; the ability to successfully develop the business model of MoviePass; the ability to integrate the operations of MoviePass, MoviePass Ventures, MoviePass Films, Moviefone and other acquired businesses into Helios’ operations; MoviePass’ ability to retain its existing subscribers and market and sell its services to new subscribers, and the risk factors described in Helios’ Annual Report on Form 10-K for the fiscal year ended December 31, 2017, its quarterly report on Form 10-Q for the quarter ended June 30, 2018 and other filings, including subsequent current and periodic reports, information statements and registration statements filed with the U.S. Securities and Exchange Commission. You are cautioned to review such reports and other filings at www.sec.gov.